I can't believe you got that close to a hawk! Were you scared? I've never heard about Pale Male but now I'm obsessed. So cool. Jeff and I had a great weekend pool-hopping, it was the only way to survive the heat! We're lucky we have good friends who don't mind when we invite ourselves over to their pool. At the Englander's pool on Sunday, DH was telling me about this website I had never heard of called Copy Cat Chic. Want a gorgeous table from Restoration Hardware, but can't lay down $2,000? Reichel probably knows of a knockoff for much less. How about $1,000 off this RH bookcase? Is it perfect? No. But it's pretty good. 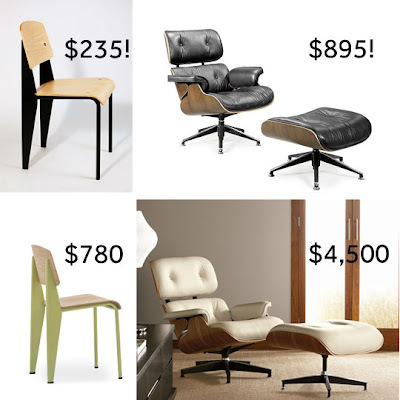 So next time you're pinning after Crate & Barrel lamp, definitely check Copy Cat Chic first. Now that's some savings! Speaking of knockoffs, Apartment Therapy is having a panel discussion tonight on the very topic called "Knockoffs: Flattery or Theft". I know this topic applies to the fashion industry as well and I think it's fascinating. I would always prefer to have vintage originals but not many can afford to spend 5K on a chair! So I am all for knock-offs!! !